Hey dabuz, thoughts on Smash u? I hear you think Fox is top three. I am actually pretty interested in your opinion and I respect you. Is it because his results are dominate? In your signature, you have the wrong Twitter account. 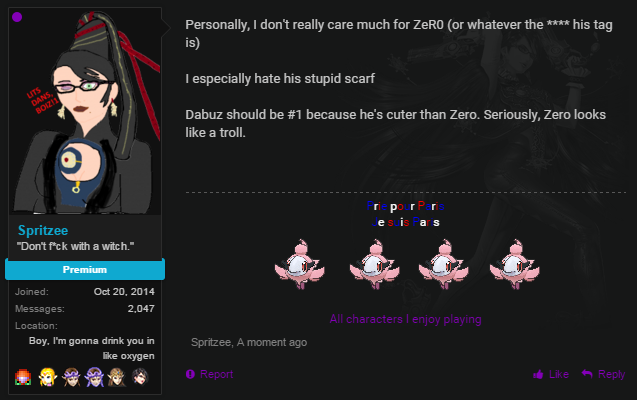 You put in "DabuzSensei" while I'm sure your actual Twitter account is "DabuzSenpai". buzzy, I wanna go to tours in long island area except I don't have I facebook and I cant get one, so what other ways can I be informed about when tours happen? ask raptor on twitter i guess? Hey, first off, I enjoyed that you were able to take time and visit the Competitive Impressions thread and give us some of your opinions (with good description as to why you think the way you do). It's really nice to hear from a really intelligent smash player like yourself. Also, I have a question, if you're willing to answer it. Hey there Long time how have you been man? and how's everything with smash Dabuz? Lewd! Lewd! Don't be lewd in public! I'm sorry!! Please forgive me! The first time I watched GENESIS 3, I was rooting against you. Now that I co-main Rosaluma, I think you're a real genius with the potential to become one of the revered (or most-hated, like hbox) Smash gods. Keep it up dude and I hope to see more of you at the higher levels of Smash play! Hello There Long Time no Talk How have you Been? and Happy New Year Dabuz!!!! Well look who has 3 posts about them on the frontpage of /r/smashbros. Thank you so much Dabuz, you da bes!!!!!!!!!! Huh, so you like Reimu? Man, I sure noticed a lot of people in this site liked Touhou, but I didn't expect you to like it! Nice! wait. not boring as in boring or not boring as in Boring? ooh! here's a joke: what do you get when you cross a pillow with the force of a truck hitting a brick wall while it was going 85mph? Hey, I've been trying to reach you. Remember on twitter when you posted "Rosa is op luma just carries her"? You've never seen this, but sorry for saying you used to play like a Cheetah on my first post. Never knew I had something in common with the best rosalina player ever. Oh lawd but I'm a fan. I dunno if you check this account very much, but you did good in the tournament man. Props to you. Aww you da bes!! I didn't even have to sweeten the pot! I mean, I would've offered you a Macchi, but I guess it's best you didn't choose it. Cute avatar man, and great showing at SSC! Happy Birthday your the true king of Smash4!!! Thanks, I Wish but i'm at smash con!